Alaska's university system is ramping up programs to train the next generations of fishery and ocean specialists for jobs that await. Since 1987, the College of Fisheries and Ocean Science at the University of Alaska Fairbanks has offered undergraduate and graduate degrees in fisheries science, complete with paid internships for most students in one of the state's largest industries. "It's a degree path preparing students for what I call fish squeezers — they're going to go to work for the Alaska Department of Fish and Game, or NOAA, the U.S. Fish and Wildlife Service or some other type of agency where they're going to be primarily out doing fieldwork, traditional fish biologist types," said Trent Sutton, a professor of fisheries biology and associate dean of academics. Due to student interest, the college broadened the fisheries degree this fall to include ocean sciences, and opened more oceanography and marine biology classes to undergraduate students. The new degree-combo program attracted 53 students, Sutton said. The college is a center for ocean acidification studies, too — a big student draw. "You hear all the concerns regarding climate change and marine mammals and fisheries and sea ice — all of those garner interest from students because there are job opportunities down the road to deal with these issues," Sutton explained. UAF's program is the only school in the nation to offer a bachelor's degree in fisheries for students interested in seafood sciences and technology as well as marine policy. Another focus of the bachelor's track is rural and community development, where students can earn their degree at home. "A student in Bethel or Dillingham can stay home and take 100 percent of their courses either through video conferences or online or some other distance-delivery technology," Sutton said. "They can get a degree tied to fisheries, and it will help them have a good career and become leaders in their communities," Sutton said. Starting next fall, the College of Fisheries and Ocean Science plans to offer degree programs in partnership with the University of Alaska Southeast, and eventually the Anchorage campus and other regions. A shorter career track for fisheries technologists is offered through the Sitka campus, training students for jobs as fishery observers, surveyors, culturists and hatchery technicians. Fish-tech certification and associate degree courses are offered remotely, with classes fully loaded onto iPads — no internet required. There is a shortage of fish techs in Alaska and that trend is expected to continue for at least a decade, according to university data. In fact, good careers await fisheries and ocean science grads in Alaska, as state and federal agencies are steadily losing workers to retirement. Of the nearly 700 graduates UAF's program has produced over 30 years, nearly half have gone on to careers at Fish and Game or the National Oceanic and Atmospheric Administration, Sutton said. Bait is critical to most fishermen, who sometimes scramble to find enough. "Things change over the years. We always try to find what is the new best thing and stay ahead of the curve," said Justin Hackley, vice president of sales and marketing for International Marine Industries of Newport, Rhode Island, a global bait provider for more than 30 years. Alaska is one of Hackley's biggest customers, and bait favorites have shifted due to changing weather patterns and fish availability. 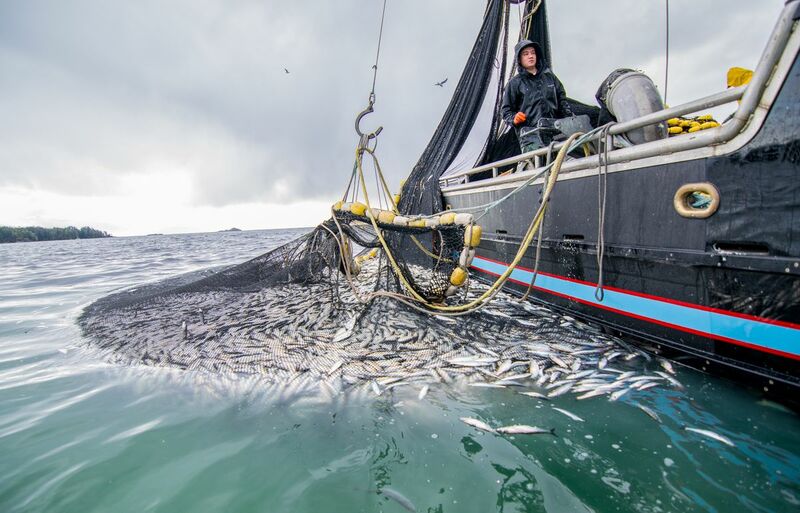 For decades, East Coast herring kept Alaska fleets fishing — until a better option surfaced. "It was herring for halibut or black cod longlining, or for crab or pot cod until a cheaper alternative came around — Pacific sardines caught off the coast of Astoria (Oregon). That fish had fat content at 18 percent, way higher than East Coast herring," Hackley said. But the Pacific sardine fishery closed three years ago, and Hackley scrambled to find a replacement. It took some convincing, but last year Kodiak fishermen and processors agreed to bite on Pacific saury, "the new up-and-coming bait," he said. Saury will be soaking in Tyler O'Brien's pots when he sets out on the 58-foot Odin's Eye for cod in January. At $1 a pound (up from 50 cents last year), he estimates the bait cost at $4,500 for each three-day fishing trip. Fishermen use different baits depending on the fishery, and often mix their own blends from scraps to save money, O'Brien said. "For crab we'll catch and use fresh herring or cod and salmon roe. In the fall, we'll get pink salmon discards from processors for halibut bait," he explained. Already, demand is increasing for Pacific saury, Hackley said, and bait prices for squid have increased to $1.35 a pound at Dutch Harbor, up from 85 to 90 cents a year ago. The total salmon harvest for 2016 came in at 112 million fish, based on preliminary numbers from Fish and Game. The value to fishermen of $406 million is the lowest since 2002. The 2017 forecast for Bristol Bay sockeye is 27.5 million fish, down 26 percent from this year's harvest. State managers predict Upper Cook Inlet fishermen will see a much lower commercial harvest of just 1.7 million sockeye salmon next summer, 1 million fish below the 20-year average. The forecast for pink salmon in Southeast is for a "strong" catch in the 43 million range, more than double the 18 million pinks taken in the region this summer. The halibut industry will get a glimpse of next year's cap when the International Pacific Halibut Commission meets Nov. 29-30 in Seattle. The commission will take up 13 requests for management changes to the fishery, including whether it will be legal to catch halibut with pots in 2017. The fishery will open in March. The state Board of Fisheries meets in Homer Nov. 30-Dec. 3. The focus is on commercial, sport, subsistence and personal use fisheries in Lower Cook Inlet.